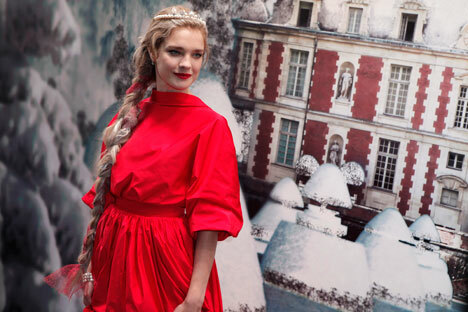 The entire world has been watching the history of a Russian Cinderella - Natalia Vodianova, a supermodel who has conquered the world of fashion, with the "eyes of a lioness." She is a girl from a poor family in a Russian provincial town who got in the swirl of Paris life by a miracle. He is a lord by birth, one of the richest men in the United Kingdom. They met at a private party and the rest is history: marriage, three children, and seemed to settle into a happy life. Many fans of Natalia Vodianova wonder how she manages to do everything—raise three children, manage her career and run her own foundation—at the age of 31. Unless one knows how much work she has done, one may think she flew up the fashion Olympus in two years with simply a stroke of luck. In fact, Vodianova went to a Nizhny Novgorod model agency at 16 with the sole purpose of finding a way to earn a living. In Russia at that time, private business was picking up with a rising interest in advertising and promotion. Models were often invited to participate in promotions such as samplings and lotteries in supermarkets. The money was little, but intuition prompted Vodianova. She knew that it was her looks she should place her bets on. "I understood that men were paying attention to me, so I had something," she has said. At first, she said, it made her sick standing at a "beauty parade" with hundreds of her colleagues. Nonetheless, she put on a skirt at a casting hurriedly sown from her grandmother’s dress and stood aside, not even suspecting that she would be chosen and start on her way to the stardom. But she was noticed, invited to Moscow and photographed for Russian Vogue. But after several months at another Paris contest, she was noticed by Jean Paul Gaultier. “A combination of immaculacy and sexuality! A child and female at the same time!" he called her. She was then picked up for German Elle and participated in the New York Fashion Week. "This Russian," as she was called then behind the stage at the fashion week shows. She was then invited to work with Yves Saint-Laurent, Gucci and Calvin Klein. And soon she became "the face and body" with Calvin Klein. Then contracts with L`Oreal Paris and Chanel followed, and the symbol of every model's success—shooting for a Pirelli calendar. Vodianova scored a success none of her Russian colleagues could boast of, before or since. But a model without individuality or an interesting history is not that highly valued. But Vodianova had all of these. Firstly, she married Lord Justin Portman, a talented artist. Then she had three children, returning to her work each time in record-breaking short time, just several weeks. She now engages in charity and established the Naked Heart Foundation, which handles the construction of specialized playgrounds for children with developmental defects all over Russia. Her younger sister suffers ICP and autism, which influences Vodianova’s interest in starting the foundation. Subsequently, Vodianova is now on of the top 300 richest people of Great Britain. Not everything was bright, however. Vodianova parted with her "prince" and devoted herself to her children and foundation. The fairy tale changed to a romance. She met and fell in love with Antoine Arnault, the son of the owner of Louis Vuitton, and is now expecting another child. "Yes, I'm happy, rich and famous!" Vodianova said. "But I remain a simple girl from Nizhny Novgorod. When the fame came, I wished one thing only – to be free of stardom disease. I think I've managed it. And I'm pleased because of that most of all!"